This was a very special project for us for a very special family of 5 that includes a son in a wheelchair. Our clients wanted a house where their son could go everywhere that they went in the house. They yearned for him to become as independent as he could be, and wanted more ease for their daily activities. A house that is wheelchair accessible is inevitably larger, with wider corridors and doors. We did everything we could to provide them with a sustainable house that stretched the budget using simple materials. Their high energy, strong imagination and can-do attitude made them brave about installing their own geo-thermal heating system, and making the house solar ready for the future. A radiant heating system in the polished concrete floor allows for warm floors throughout the house. Craig Johnson, working for Legacy Homes did an exceptional job translating our design into a reality for them. 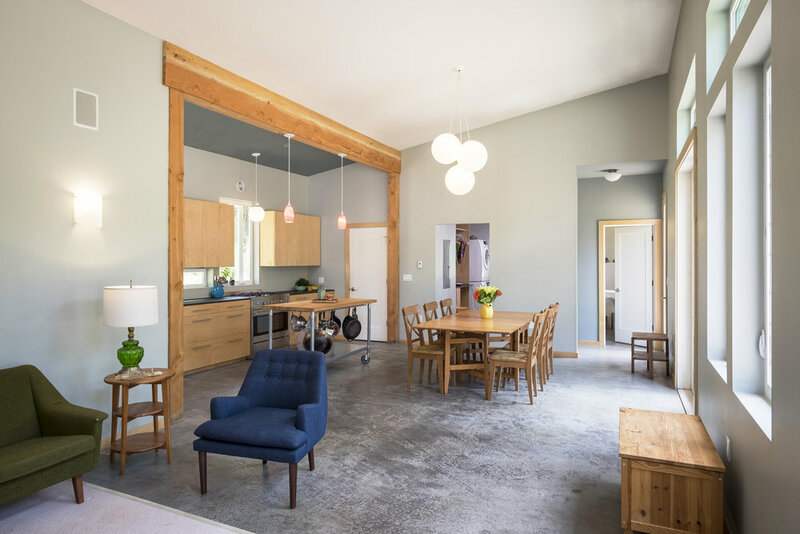 The house was built entirely of SIPS panels to increase insulation and decrease construction time on site, therefore lowering construction costs. Another notable green feature were triple-pane windows to increase energy conservation. We were very grateful to Karen Braitmayer, an exceptional ADA consultant who helped us refine our plan to meet the needs of a wheelchair user.